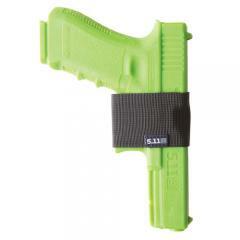 Secure sidearms with confidence using the 5.11 Tactical TacTec Holster Pouch. The minimalist design features a fully adjustable retention strap able to accommodate a wide range of pistols and attachments. A non-slip coating provides additional traction to ensure that pistols stay secure during intense physical activity. MOLLE webbing and a hook backing allow for versatile transport and compatibility with a broad spectrum of 5.11 Tactical products, including most bags, vests, belts and tactical outerwear. The TacTec Holster is constructed from high-strength nylon with double reinforced stitching to ensure maximum durability for long lasting service life.